New York | Mumbai, April 21, 2015: Tata Consultancy Services (TCS), (BSE: 532540, NSE: TCS), a leading IT services, consulting and business solutions organization, today announced that it has received the 2015 SAP® Pinnacle Award for Run SAP Partner of the Year for the third year in a row, and was a 2015 finalist for the Services Transformation Partner of the Year. SAP presents these awards annually to the top partners that have excelled in developing and growing their partnership with SAP and helping customers run better. Winners and finalists in 22 categories were chosen based on recommendations from the SAP field, customer feedback and performance indicators in the following umbrella categories: Exponential Growth, Cloud, Platform and Value Creation. 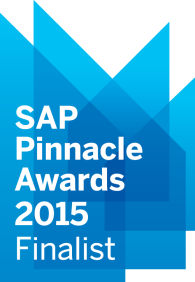 TCS is among an elite group of only 19 partners worldwide in 2015 to win an SAP Pinnacle Award, and one of only 45 companies out of 12,800 organizations in SAP’s broad partner ecosystem (less than 1 percent) shortlisted as an SAP Pinnacle Awards finalist. These accolades showcase TCS’ excellence in driving SAP business and co-innovation and helping SAP and TCS mutual customers to run better. In addition to these esteemed SAP accolades, TCS was recently recognized by Gartner as a Leader in the Magic Quadrant for Worldwide SAP Application Management Service Providers, and as the third-place provider in large-, midsize- and small-scope and -scale deals in Critical Capabilities. TCS is a US $15.5+ billion company and one of the largest and fastest-growing partners of SAP with more than 13,500 dedicated SAP consultants. TCS has grown its SAP business 30 percent in each of the last two years alone, and now has more than 450 SAP projects around the world that serve as world-class proof points of the results generated for clients. Award winners will be formally recognized at the SAP Global Partner Summit being held on May 4, in conjunction with SAPPHIRE® NOW, SAP’s international customer conference being held in Orlando, Fla., May 5-7. TCS is the exclusive sponsor of the SAP concert at SAPPHIRE NOW with pop superstar Jennifer Lopez. SAP Pinnacle Awards shine a spotlight on SAP partners’ remarkable contributions, acknowledging their dedication to teamwork, innovative approach and capacity to challenge what is possible to help customers achieve their goals. The Run SAP Partner of the Year award bestowed upon TCS is in the Value Creation category. The Value Creation awards recognize partners that extend SAP solution offerings, drive shareholder value, create new and innovative business models, accelerate the impact of technology investments, or help customers transform their business. The Run SAP Partner of the Year award recognizes the SAP partner that has achieved customer successes by implementing and operating SAP best practices for support and demonstrating the value they bring to customers. The Services Transformation Partner of the Year award, for which TCS was a 2015 finalist, honors the systems integrator/service partner that has demonstrated the largest expansion of its services capacity (SAP trained and certified consultants) in targeted growth markets and high-growth innovation areas. *SAP, SAPPHIRE and other SAP products and services mentioned herein as well as their respective logos are trademarks or registered trademarks of SAP SE (or an SAP affiliate company) in Germany and other countries. Click here for additional trademark information and notices. *All other product and service names mentioned are the trademarks of their respective companies. Tata Consultancy Services is an IT services, consulting and business solutions organization that delivers real results to global business, ensuring a level of certainty no other firm can match. TCS offers a consulting-led, integrated portfolio of IT, BPS, infrastructure, engineering and assurance services. This is delivered through its unique Global Network Delivery Model™, recognised as the benchmark of excellence in software development. A part of the Tata group, India’s largest industrial conglomerate, TCS has over 319,000 of the world’s best-trained consultants in 46 countries. The company generated consolidated revenues of US $15.5 billion for year ended March 31, 2015 and is listed on the National Stock Exchange and Bombay Stock Exchange in India. For more information, visit us at www.tcs.com.